Click below to watch our video or scroll down to learn more about our quality products! Since one size keyboard cover fits all standard keyboards, you don't have to catalog your keyboard inventory. Just order a SpeedSkin standard cover or an UltraSlim cover. Also, when you get new keyboards in your classroom, it's likely that the keyboard skins you have will fit the new keyboards. Re-ordering may not be necessary. For help in making this decision, click the tab: PC or UltraSlim Cover? Teachers love our keyboard covers for typing because using them typically accomplishes their curriculum goals ahead of schedule AND improves their classroom experience. Our no-peek keyboard covers save you from tedious monitoring when you’re helping children learn keyboard typing. 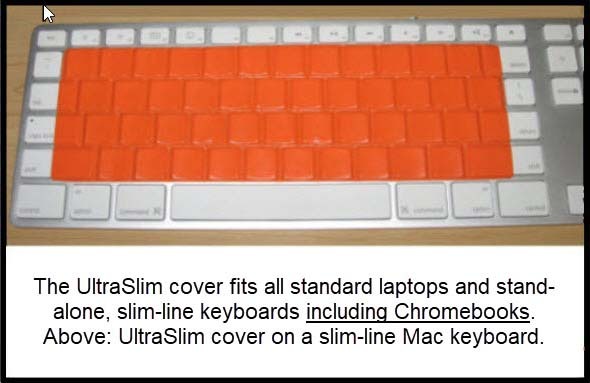 Contact us for more information on our amazing keyboard cover products. SpeedSkin/PC Covers: For quantities 1-10 covers: $10.32/cover; for quantities 11-100: $9.82/cover; for quantities 101-500: $9.32/cover. UltraSlim Covers: For quantities 1-10 covers: $10.49/cover; for quantities 11-100: $9.99/cover; for quantities 101+: $9.49/cover. Ordering Options: SpeedSkin accepts purchase orders by fax or mail, credit card orders through its online store, and checks. POs can be faxed to (818) 332.4243. Do not attempt to use a purchase order using SpeedSkin's online store; please fax, email, or mail POs. Email: info@speedskin.com; mail POs or checks to: SpeedSkin LLC, 372 S. Eagle Rd., #345, Eagle, ID 83616. If you order by check through the mail, delivery of your order will be delayed by 7-10 days. Purchase order, online purchase, or faxed POs are recommended to expedite receipt date. Shipping & Handling Charges (S&H) • $8.99 for 1-3 keyboard covers only • $15.85 for 4-14 keyboard covers only • $17.85 for 15 to 24 keyboard covers only • $19.35 for 25-40 keyboard covers only. For orders over 40 covers and orders including posters, and/or desk reference cards, see Non-Standard Orders below. International Orders: Customer will be charged the basic shipping rate (above) for the quantity ordered. Additionally, the customer will be charged a second time for the difference between the basic shipping rate and the international shipping rate by accessing the credit card used for the purchase. Non-Standard Orders — If the online store default S&H charge for a non-standard credit card order is insufficient, SpeedSkin will access customer's credit card for the balance of the S&H charge. Additional S&H charges for a non-standard order will be added to the invoice or credit card amount for the following: orders over 40 covers; combinations of covers with others of SpeedSkin's non-cover products (posters and/or desk reference cards); and non-cover product orders (posters and/or desk reference cards). Additional charges will be based upon: a) method of shipment (best way, ground with tracking); b) expedited shipments; c) destination location within the United States; and d) shipments outside the United States. If paying by check or you have questions regarding a non-standard order, call 800.558.7601 for an estimate of or quote for additional S&H charges. If paying by check, a) if S&H amount exceeds S&H charges, the customer will receive a refund; b) if S&H charges exceed the amount included in the check, SpeedSkin will delay shipment, notify the customer of the difference owed, and await payment by credit card or check before shipping the order. If you order by check through the mail, delivery of your order will be delayed by 7-10 days or longer if a balance is owed for S&H. Refunds and Exchanges: SpeedSkin offers a risk-free, 30-day trial period for a refund or exchange including S&H based on the customer’s receipt date. A refund will apply only to orders with 1 or 2 opened units and the balance of the order is returned unopened and suitable for resale. If all or more than 2 units are returned opened, there will be a standard-for-the-industry, restocking fee of 15% deducted from the refunded amount. If SpeedSkin fulfilled the order correctly and you wish to exchange the product, SpeedSkin will charge S&H fee for the exchange order; customer will pay the return shipping fee for the original order to complete the exchange process. Please call 800.558.7601 for a Return Merchandise Authorization (RMA) number BEFORE returning your order. Returns and exchanges will not be processed without an RMA number. These terms are restated on the Packing Slip included in your shipment. You can order SpeedSkin products with confidence based on this 30-day, risk-free trial period under these conditions. Non-standard S&H and refunds/exchanges based on an authorized RMA will be determined on a case-by-case basis. Pay by check using address information provided on our Contact page. Click Contact link in the footer below. If you would like information about becoming an authorized SpeedSkin dealer, please contact SpeedSkin: (800) 558-7601 or email to info@speedskin.com. SpeedSkin welcomes international dealers. Please contact SpeedSkin: (800) 558-7601 or email to info@speedskin.com. 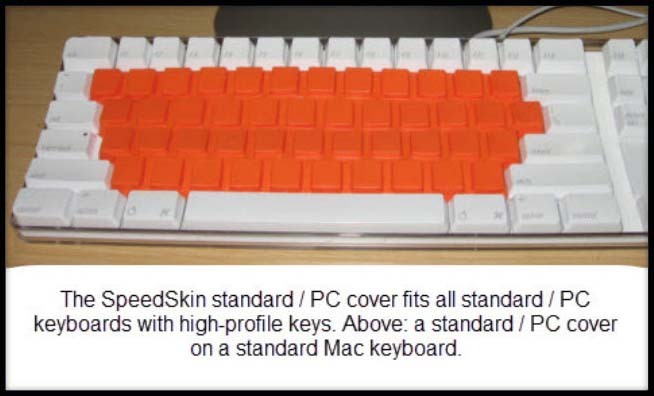 SpeedSkin's authorized dealers can offer blank, non-printed keyboard covers at lower prices than SpeedSkin's prices.